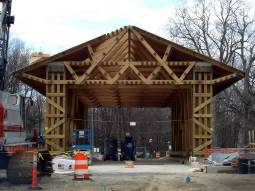 In May of 2009, Portland Bolt received a request to manufacture and supply fasteners for the replacement of the Pepperell Covered Bridge in Pepperell, Massachusetts. The original Pepperell Bridge was built over the Nashua River around 1742 and has been rebuilt or replaced several times throughout its history. The most recent structure was built in 1963, but was in serious need of replacement due to rusting of the support structure and general wear and tear. When it is completed in 2010, the new structure will weigh 475,000 pounds, be made of 700 pieces of solid timber, and be 33 feet tall, with the longest span measuring 95 feet. Portland Bolt manufactured over 3,000 pieces of galvanized domestic fasteners including square head lag bolts, dome head bolts, and high strength rods for the project. In addition, we supplied over 20,000 pieces of hardware to accompany the manufactured bolts. All items arrived on site within the time frame specified by the contractor with full material certification.